I’m starting slow. When I see one of these that hasn’t set buds for whatever reason, instead of leaving it to gather strength for next year, I just pull it out, bulb and all. I’m also more likely to cut some of these to bring inside, allowing for longer stems than I have in the past. I’m not going cold turkey, not even close. They say doing it gradually is actually harder, but I’m by no means sure I’ll have to kick the habit entirely. The battle against the lily beetle is getting just a bit wearisome. Truth is, I don’t have much patience with pest or disease management. I hate spraying anything; even my fertilizing regimen has been reduced to throwing down some Rosetone in spring and top-dressing with compost once in a while. Lilies were never high maintenance except for staking, and, considering I have partial shade, staking is something I have to do with a few other plants. There is something satisfying about tying up a plant so it will stay where you want it. I’m not one for recording insect damage, but you can see it on the leaves of this one, from last season. That is all changed now. Every day I need to go around to all the plants and watch for the little red bugs, which must be removed and killed. Then, the leaves have to be either swiped clean of the hideous, excrement-covered larvae, or removed if they are too far gone. I’ve done pretty well; most of my plants are in decent shape, except for the martagons, which seem to be a favorite. Container plants do better and weird hybrids appear to be disliked. These doubles in containers are untouched. It is sad, because lilies are among of the first things I planted. I’d always loved them in arrangements and was amazed that these beautiful flowers were so hardy and so easy to grow. 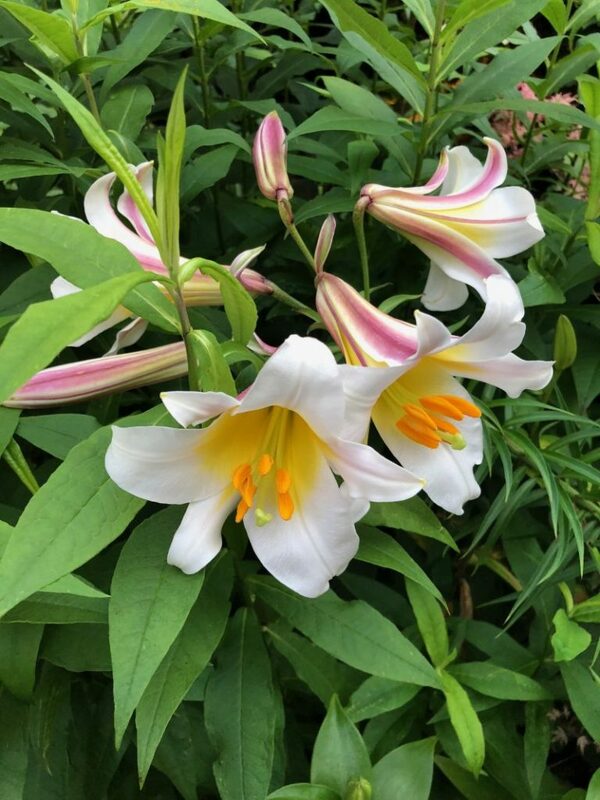 Unlike most spring bulbs, lilium foliage is minimal and the stalks unobtrusively decline near summer’s end. They give a burst of color and fragrance at a good time: right around Garden Walk. 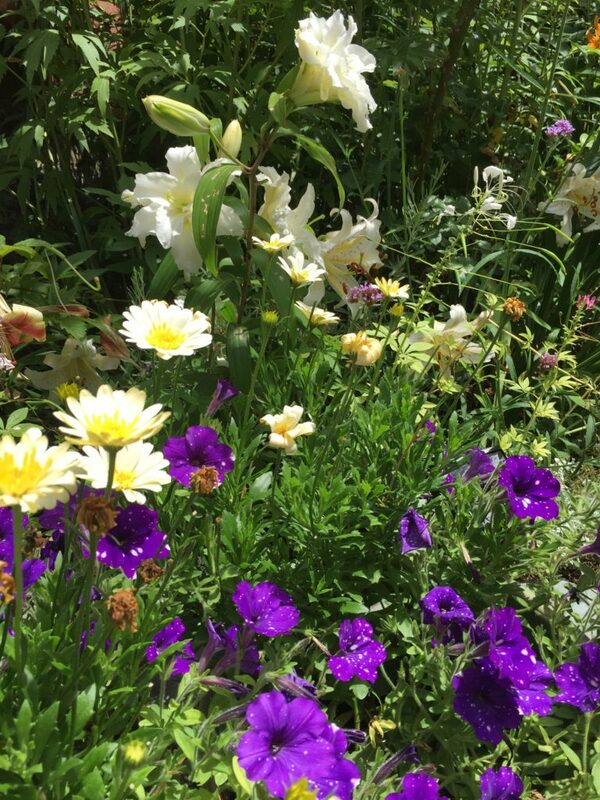 For now, I’m keeping up the fight, but, at the same time, I’m whittling myself down to a maintenance dose: lots of container lilies and a few stands here and there, where they are semi-hidden by roses and tall perennials. Did you ever have to kick or cut way down on a plant habit? It’s not easy! three varieties, which greatly eased the pangs of withdrawal.) As with your lilies, container growing is more feasible and lower risk. I’m feeling lucky. So far. I have plenty of lily beetles, do nothing to control them (too much else on my hands) and their damage to leaves is fairly obvious, but so far they’re not greatly affecting the health of most varieties. They seem to love Asiatic lilies best, and have largely killed those off in my garden. They go after regals, and those are thinning a bit. Orientals and Orienpets are largely untouched. Fingers crossed! It’s painful to remove or cut down the plants you love. I suspected I had rose rosette in December. It was semi-confirmed by a Texas Agri-Life horticulturalist in January, but the symptoms had just appeared so they weren’t full-blown. I was advised to either completely remove the roses, roots and all, or to cut them to the ground, throw the cuttings away, and to spray for mites. I chose the latter with fingers crossed. I felt so sad cutting them down. They were my favorite antique roses. These roses have grown back to shadows of what they were but so far, I don’t see symptoms of rose rosette. I used to have over 20 oriental lilies, they’ve been disappearing for years. Last year I had 4, only 2 came up this year. It was a hard winter here in MA, and I lost a lot of plants. But the weird thing…no lily leaf beetles this year! That hasn’t happened in years. Until this year, I had a lovely lily near my house…and every year the chipmunks ate the buds. Yes, I am gradually winding down my iris virus. No more ordering of TBs. They are prone to borers and have to be staked here because of our winds. Now I am concentrating on the dwarf varieties. It is sad, but I don’t have time for the tall ones any longer. Fortunately, I have few plants left in my garden that require extra TLC. Like you, I’m not a fertilizer or pesticide user. This past spring, I had an aphid invasion. I made a herculean effort to get rid of them on my Lithidora and Sun Roses, but I had a plant in my backyard that got coated with the pests, just coated! I pulled it up and threw it away. Tulips? Gone, since the deer find them so munchable. Zucchini? I will NOT spend my entire summer, smashing squash bugs. I’m a savage gardener. If some plant gets just a little too fussy or too big for its britches, it’s going. My False Indigo (Baptisia) is headed for some friends’ gardens soon. The other one went to my sister. Tough love here. Elizabeth, I love your lilies in pots and that seems like a super solution to your issue with the bugs. That’s a very pretty look! I have a glorious Hibiscus- dinner platter size flowers which every year has leaves eaten by Japanese beetles. It’s an awful look. It’s going. I lost plants with the long, cold winter. This summer there’s so little rain in my part of NY. I won’t keep plants that need lots of watering. It’s hard to make these decisions, but they make sense. Elizabeth, I’ll send you a small ray of hope from over here in the Finger Lakes. This year, for the first time in many, I’ve seen very few LLB’s. My fritillarias were untouched this spring, and so far my lilies have been virtually free of them. Maybe, just maybe, the plague is beginning to wind down…. Why oh why can’t some pestilence start wiping out kudzu, or wild honeysuckle, or wild rose brambles, or poison ivy, or my nemesis, bermuda grass in the flowerbeds???? Oh yes, I’ve had to kick the hybrid rose habit because of Rose Rosette; even my beloved Buck roses have mostly fallen; I have a Carefree Beauty, two Applejacks, and, oddly, a Spanish Rhapsody untouched. And all the Rugosas seem to be okay at present so I’m “suckering” them out. It sure has cut down on what roses I can give talks about. I used to have oriental lilies too but now they’ve all disappeared. Thanks for the advice Elizabeth. 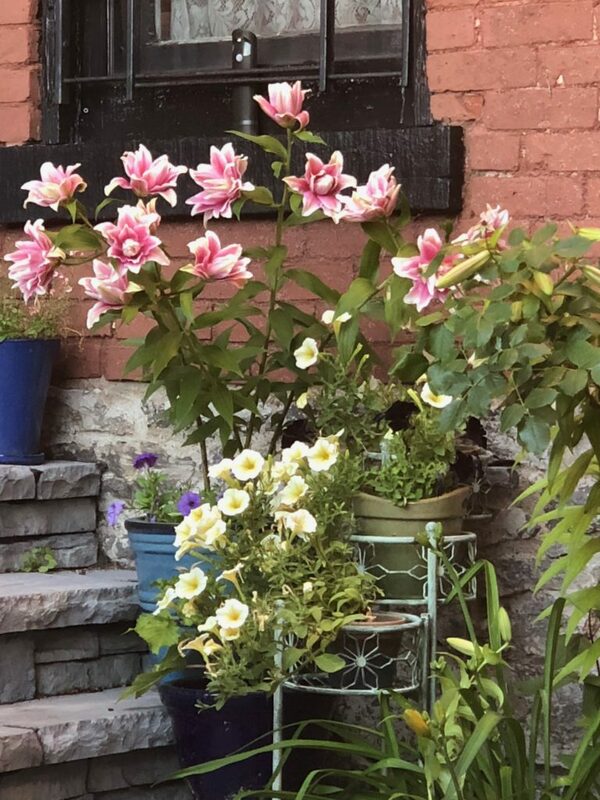 Last year I squashed lily beetles and sprayed soapy water on the leaves every day, this year I have not seen a single one and my lilies are beautiful. Elizabeth, I’m sorry. It’s hard to lose a beloved class of plants. I don’t usually comment on blogs but I had to chime in on this thread. I moved in with a friend 5 years ago. I basically brought my entire garden with me with the help of my friend’s son. I even dug up our peony bush. (After 5 years it’s finally starting to look like something.) I also brought my beautiful pink garden phlox. The previous owner had planted it and I kept dividing the plants and putting it in new places. Then I discovered that my friend’s house in plagued with deer. I’d never encountered them before. At the end of that first summer, I pulled out and gave away all my beloved phlox because I couldn’t bear to watch them be eaten by the deer and then struggle back to life only to be eaten again. Last year, I was looking at a huge baptists plant and there, from underneath the baptista, was one of my old phloxes. I’m happy to report that it has come back this year and is even fuller. Miracles happen!